Chuck Monjak was partway up his first-ever attempt at a nearly vertical ice formation. That is when he found himself in a terrifying dilemma. With his weight supported only by the tips of his crampons, he had to figure out how to get around a bulging column of ice. If the location's name where Monjak was learning to ice climb didn't evoke a sense of horror - Frankenstein Cliff - then one look at the route he was attempting certainly did. Earlier in February, an ice climber had to be rescued after falling 50 to 60 feet on Cannon Cliff in New Hampshire. In upstate New York, a woman survived a 70-foot spill at Kaaterskill Falls, and another climber tumbled nearly 40 feet at Platte Clove. Both of those falls happened on the same day in January. 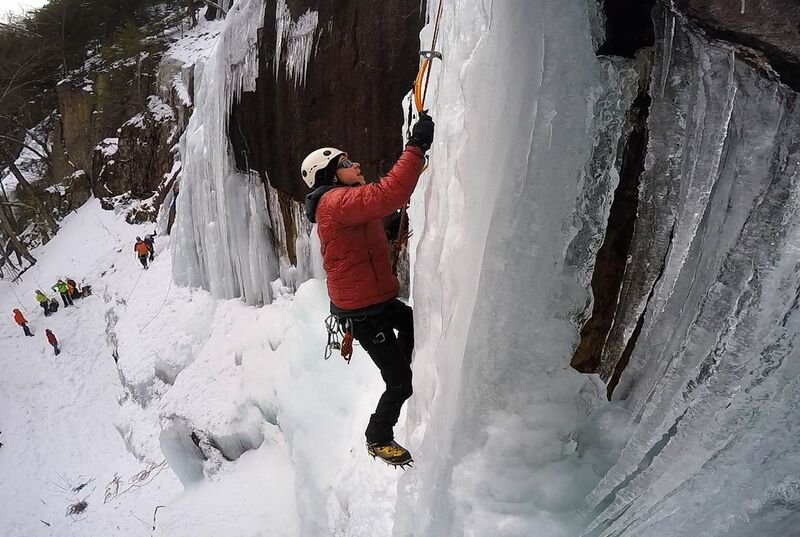 Monjak, a rock climber turned ice climber, said the key is to stay within one's abilities. On Dracula, Monjak trusted his life to a rope being belayed by his partner. That was Yuki Fujita, who has been climbing Frankenstein's ice for nearly 50 years. Fujita is 69. The retired nuclear engineer climbed the route first. Climbing a frozen waterfall is like solving a puzzle because the water comes every side and some are frozen and the water is only frozen in different spots. That is why i think the waterfall is like a puzzle. Climbing a frozen waterfall is like a puzzle because you need to know where to step on what so you wont fall down. In the article "Would you climb a frozen waterfall? " it said that A lot of engineers, technical people, get into this because of the problem-solving abilities necessary to do vertical ice. That is why climbing a frozen waterfall like solving a puzzle. You also have to think about the slight chance that where you climb the ice may start melting. That could also lead to a race for safety. 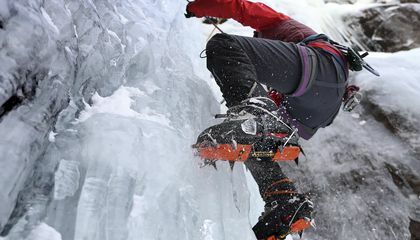 Climbing a frozen waterfall is like solving a puzzle because you need to now how and where would you start and how would you get to the top.According to the article,Would you climb a frozen waterfall?,it states,Chuck Monjak was partway up his first-ever attempt at a nearly vertical ice formation. That is when he found himself in a terrifying dilemma. With his weight supported only by the tips of his crampons, he had to figure out how to get around a bulging column of ice.That's how climbing a frozen waterfall is like solving a puzzle. Climbing a frozen waterfall is like solving a puzzle because Chuck Monjak was up for his first-ever attempt at a nearly vertical ice formation.He found himself in a terrifying dilemma.With his weight supported only by the tips of his crampons, he had to figure out how to get around a bulging column of ice.That is what it makes it a puzzle because it is hard to get up there.According to the passage "Would you climb a frozen water fall?" it says that Chuck had a hard time getting up there and it sounded like a puzzle for him. Climbing a frozen waterfall is like solving a puzzle by because he had to figure out how to get around a bulging column of ice. According to the article "Would you climb a frozen waterfall? ",Chuck Monjak was partway up his first-ever attempt at a nearly vertical ice formation. That is when he found himself in a terrifying dilemma. With his weight supported only by the tips of his crampons, he had to figure out how to get around a bulging column of ice. Based on the information in paragraph 1 I got my answer. Climbing a frozen waterfall is like a solving puzzle because you have to figure out were to step and how to get to the top.According to the article "Would you climb a frozen waterfall"?,it stated that it is an adrenaline rush and it's a puzzle-solving test and that lots of engineers, technical people, get into this because of the problem-solving abilities necessary to do vertical ice," said Monjak.He is an optical systems engineer.He works for a semiconductor firm and he climbed it himself and he had to figure out how to get around a bulging column of ice like a puzzle. Climbing a frozen waterfall like solving a puzzle because you have to now where you steep and don't fall.According to the artical" A lot of engineers, technical people, get into this because of the problem-solving abilities necessary to do vertical ice. "So know you know how is climbing a frozen waterfall like solving a puzzle. Climbing a frozen waterfall is like solving a puzzle because you have to find out how to climb the the frozen waterfall. According to the article "Would you climb a frozen waterfall?" it said "Yuki Fajita, who has been climbing Frankenstein's ice for near 50 years.". It is also like a puzzle because it is trick to find a way to the top of the waterfall. Climbing a frozen waterfall is like solving a puzzle because First you need to know how and where you are going to start climbing.In the text it said,''Chuck Monjak was partway up his first-ever attempt at a nearly vertical ice formation.That is when he found himself in a terrifying dilemma.With his weight supported only by the tips of his crampons,he had to figure out how to get around a bulging column of ice. ''This is how climbing is like solving a puzzle.